Here's an excellent Thai inspired appetizer, Sweet Chili Chicken Wings. 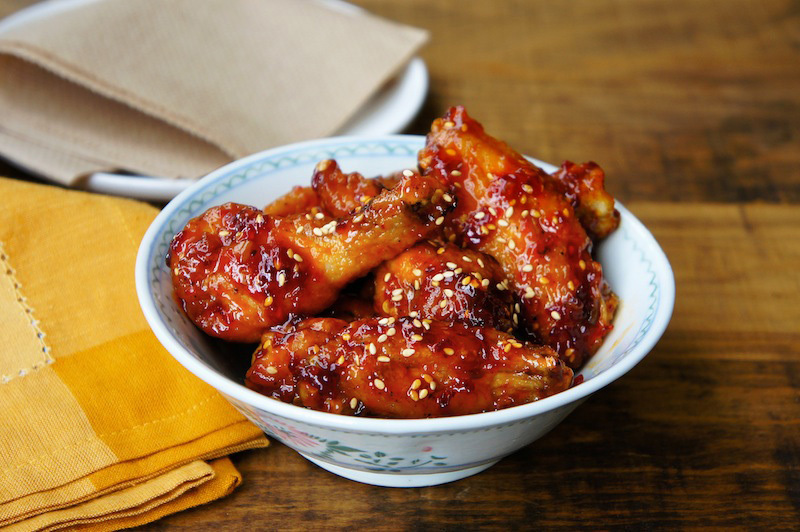 This finger licking good chicken wings are pan-fried with garlic, then coated with sweet chili sauce, sambal oelek, and a few shakes of roasted sesame seeds. Yummy! Cut off the wing tips and discard (or, use them for stock). Divide each wing into two joints. Rub the chicken pieces of chicken pieces with, salt, pepper and toss with rice flour. Smash garlic cloves without peeling. Heat the oil in frying pan and add the pieces of the chicken and the garlic cloves. Fry until the chicken is golden. Then add the sauce, stir, add in the sesame seeds until well coated, and sticky. I agree with Esther...seeing your wings makes me drool and now I am going out to buy wings to make this LOL! you are a real teaser Angie. Finger licking good ! My mouth is already watering, this look amazing!